When life gets chaotic, and it invariably does, how do you cope? One convenient, effective (and free!) option is controlled breathing. Paying attention to your breath invokes the Relaxation Response, which can reduce stress, ease anxiety, and promote clear thinking, as well as slow down your heart rate and lower blood pressure. Making breathing work part of your daily self-care can help with long-term stress management. Even 3 minutes a day dedicated to focused breathing, whether it’s when you wake up in the morning, during your lunch break or before bedtime, will make a difference in how you feel, resist stressors and decide how to respond to things that come your way. The first step is to find a place that’s comfortable and quiet, then begin your breathing. 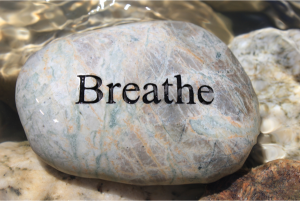 Calm your nervous system and reduce stress by balancing your breath. Inhale through the nose as you count to four, then exhale through the nose for another four seconds. Continue the process for several minutes. As you progress in your practice, slowly increase to six or eight counts per breath. This beginner technique, also known as deep breathing or diaphragmatic breathing, helps stave off worry and anxiety. Place one hand on your belly and one on your chest as you take a deep breath through your nose. As you inhale, engage your diaphragm, which is the dome-shaped muscle at the bottom of the rib cage. The hand on your belly will rise while the hand on your chest should remain still. Slowly exhale and let your stomach fall flat. When you need a boost of energy or help focusing, give this option a try. Place your right thumb on your right nostril and inhale deeply through the left side of your nose. Then close off the left nostril with your ring finger and exhale through the right nostril. Continue this pattern for several rounds. Gururas teaches breathwork, meditation, and yoga at Sweetwater Farm. Learn more….